Safety and Security Project will protect the local area from disasters. 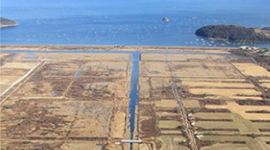 The improvement work of the 2.5 km-long drainage canal, crossing the site from east to west, has been completed and officially handed over to Setouchi City. The narrow upper section of the canal used to be easily filled with sand and dirt, and both the salt field and neighboring agricultural & residential lands were prone for flooding. The upper 400-meter section of the canal has now been widened by Toyo Engineering, the EPC vendor of the project, and reduced the flooding risk significantly. In the site, sea water flows under the embankment into the salt field, which leads development of salt marshes in the southern area of site. In the northern side near the coast, there used to be three pumps in the pump station, owned and operated by Setouchi City. The pumps pump out excess water from the Central Drainage Canal into the ocean, maintaining proper water level in the site. We donated the City an additional pump to improve the pumping capacity. This was applied and erected by Toyo Engineering. Our donation also included reinforcement of the deteriorating structure of the pump station, and an emergency power system installed in case of power failures. The 1.6 kilometer-long embankment in Kinkai Bay plays an important role to protect the former-salt field site and the local neighborhood from the risk of tsunami and high tide. In the case of a large earthquake, soil liquefaction of the area could possibly sink the embankment. In order to prevent possible damages caused by the phenomenon, we are currently reinforcing the embankment base by driving long steel piles deep underground. With this reinforcement, even if the embankment sinks during a large earthquake, the steel pipes will remain in place and protect not only our solar power plant but also the neighboring houses and farm land from a tsunami or storm surge. In addition to making the local area safe, this construction method maintains inflow of seawater under the embankment and promotes growth of rare flora and fauna inhabits. 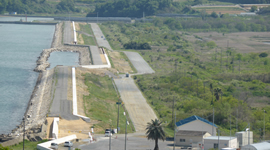 The seawalls at Tamatsu and Shiraku, located in the north and south ends of the embankment respectively, are also being constructed to prevent sea water inflows into the site during disasters. 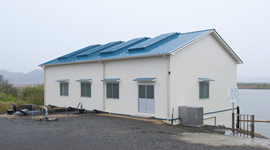 The construction works were completed by Shimizu Corporation.